Start with the Easiest & Fastest way to learn how to repair appliances with… Washers & Dryers. Washers, or Washing Machines and Dryers Repair are the most common household appliances that you’ll encounter as an appliance repair technician. By the end of our Washer & Dryers Training course you will have the skills necessary to easily repair & service Washing Machines & Dryers (modern & old school). If Hands on Training is a concern… this is the answer that you have been looking for. This is (in my experience almost 12 years) the most common appliance repair that you will encounter as an Appliance Repair Technician and… it’s the easiest to learn in a very short time. 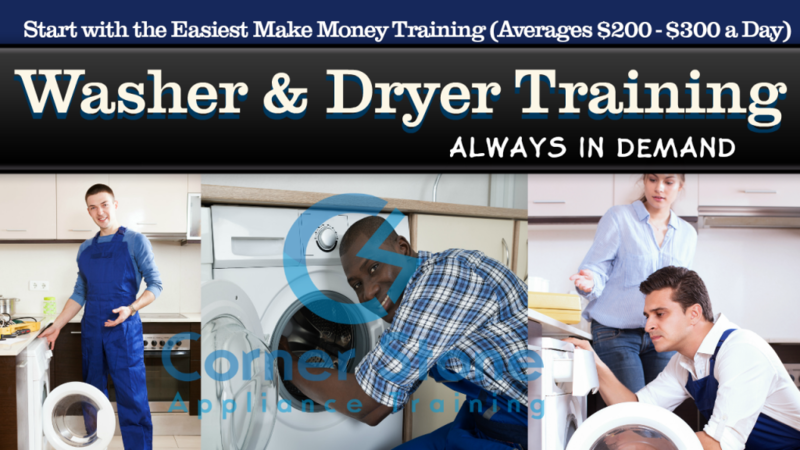 Learn how to make on average $200 – $300 a day with our Washing Machine & Dryer Repair Training course and we have BONUSES! !